The National Weather Service in Omaha has issued a Flood Warning for a large portion of Eastern and Southeastern Nebraska until 11:00 CDT Tuesday. are receding. Many county roads still have water on them due the recent flood event and it will take a while for that water to drain out. Locations with feeder streams that go into the Missouri River, the Platte River, the Elkhorn River, the Big Blue River and the Nishnabotna River are the most likely to see water problems outside of the larger river flooding. 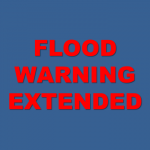 This is an extension and expansion of a previous areal flood warning. Some locations that could experience flooding include… Omaha, Lincoln, Norfolk, Beatrice, Falls City, Council Bluffs, Bellevue, Fremont, Papillion, La Vista, Blair, Nebraska City, Seward, Crete, Plattsmouth, Ralston, Wayne, Glenwood, Gretna and Auburn. Turn around, don`t drown when encountering flooded roads. Most flood deaths occur in vehicles. A Flood Warning means that flooding is imminent or occurring. All interested parties should take necessary precautions immediately.